Windows comes with its own disk management tools which can be used to perform different tasks on the hard drive. To open the default disk management utility, go to run –> diskmgmt.msc. 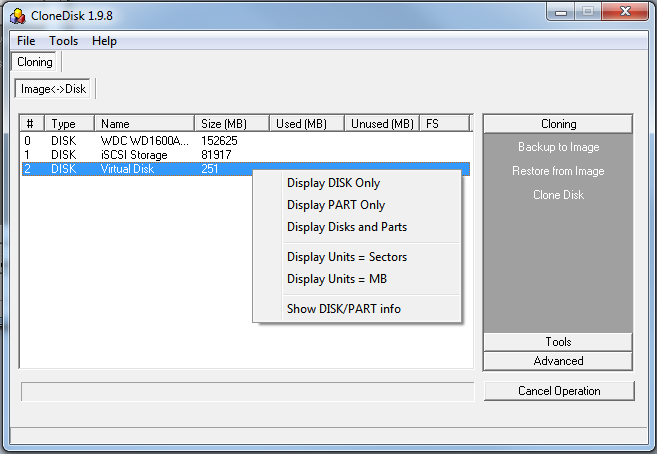 There are a lot of third party disk management utilities for Windows which are easier to use and offer a lot of additional features than the built-in disk management tool. CloneDisk is a wonderful tool to manage the hard drive including backup raw data, partition tables or master boot records, clone, format, partition, extend/shrink volumes etc. While all the features seem perfect for a disk cloning utility, CloneDisk does not have any help wizard or even tool tips to get help from. It is intended for expert users or administrators who know the ins and outs of disk management. CloneDisk needs to be run as administrator in Windows otherwise it will give invalid handle error. If you are not comfortable with CloneDisk, you may try other similar software which will be easier to use. Just make sure that you select the software which has the functionality you need. DriveXML is by far the best cloning tool which is also free. It will also let you create a live CD with which you can backup, clone or restore your drives easily. The interface is not all that user friendly but it gets the work done fine. Maricum Reflect is another great cloning tool which is free for personal use. It lets you backup or clone complete hard drives. The backups can be opened through Windows Explorer. The best thing about Maricum Reflect is that it supports RAID volumes. Paragon Backup and Recovery is another wonderful tool which comes with complete support for Windows 8.1. Paragon Backup and Recovery lets you create complete backups as well as differential backups of complete hard drives. Its disaster recovery options include restoring complete hard drive, partitions or only the files which are needed. You can also use restore with shrink feature which will restore only the actual used blocks of the backup image. It can also create bootable USB flash drive as well as Linux/DOS bootable environments for recovery purposes. What is your favorite way of backing up data of your computers? Acronis True Image is one of the best tools. Acronis True Image is certainly the best when it comes to ease of use and functionality but the only drawback is that it is not free. That’s why it was not mentioned here.